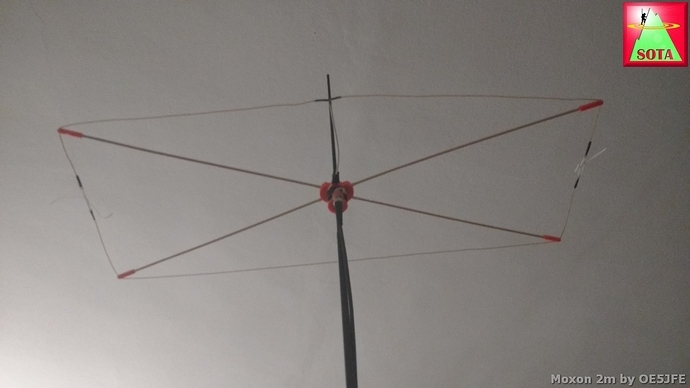 I have worked on a little portable 2m Moxon beam with the goal to make it foldable for the backpack. And also for the rare times I do some portable chasing without activation. Those sticks will be replaced by glassfibre reinforced rods. Not to worry that humidity changes the antenna properties. The sticks can be taken out from the center piece and held together with some rubber bands during transport - or store the bundle in a drawing tube for protection. It consists of 6 parts that are 3D printed in PETG material. I will publish the files when some design changes are done that I noticed now. Choke made with 6 turns of RG-188 A/U coax. Antenna wire is the lightweight type from sotabeams. Seal everything with the liquid tape stuff. Make the BNC connector a bit more robust/protected. My 3 ele yagi is looking a bit battle scared and in need of repairing with a new one. Very nice! WK2Y, new to SOTA, and I were just discussing the merits of trying one of the VHF contests from a summit. This would be a big help! Looking forward to the development. Thanks a lot for the feedback and interest. I am curious to test the F/B ratio. Will need to do some tests over bigger distance with low power to see the effect. Or use an inline attenuater in the cable. I just asked a friend to print the parts for me so I don’t know if everything fits after the changes. If you make it please let me know how it turned out. I have added another 8 mm hole for vertical polarization mounting for 2m FM SOTA contacts. Thank you for sharing your hard work Joe! 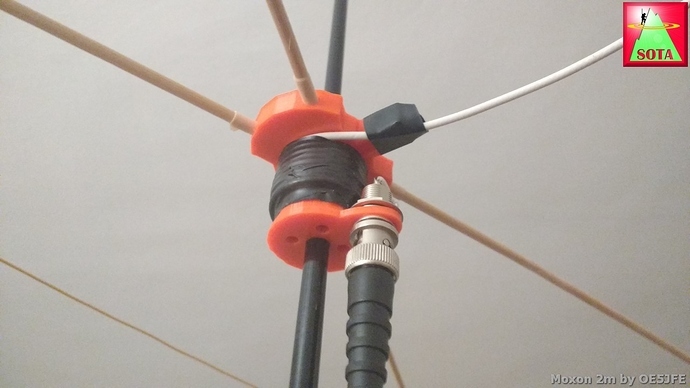 The solder connection from coax to antenna wire has yesterday failed during demonstration on a club gathering . Too much bending broke the unflexible core. But better now than on a summit. 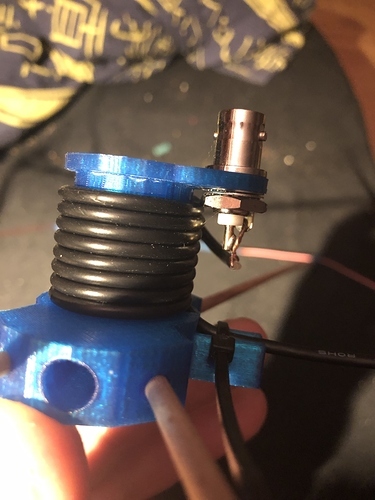 There is a small extra part included in the thingiverse zip file to stabilize that. Untested. thank you for sharing this. I have build instandly one. You might consider to move the BNC Connector a bit further out to give enough space for the cable to run throw. For all other builders the 4mm arms are 382mm long in my case. 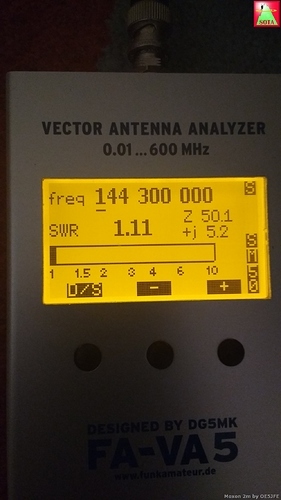 SWR is 1.04 at 145.525 very nice. Thanks for sharing your build. I was was thinking on a version with a bit more space to also hold RG58 type cable. I will make a second optional center. I have already added a 45° angled BNC connctor to allow horizontal and vertical operation. That should help already. Excellent, the cable tie is just were I figured it should be. I was wondering if thingiverse sends our notification if I make changes? That would be a nice feature. Thanks for sharing Joe. 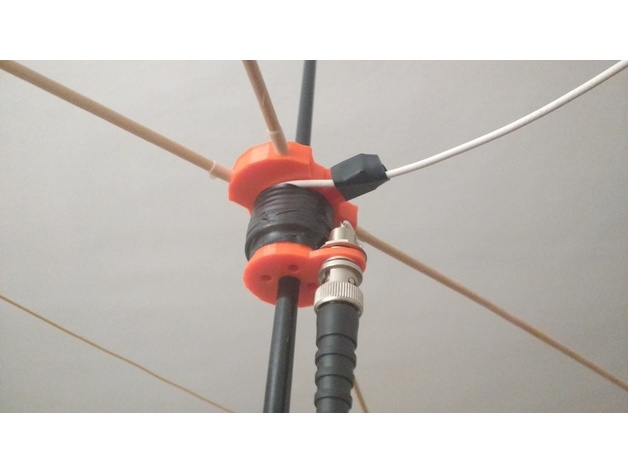 The Moxon is a great design that gives some gain/direction with a smaller footprint when assembled than a Yagi. I built a Moxon for 2m QRP/P a while back where I used aluminium rods. The two elements were separated by short lengths of fibre glass rods and I used electrical connectors to allow it to be quickly assembled without tools. Mine was designed for handheld use and had boom made of PVC conduit. I wrapped the coax round the boom to form a choke. I like your design better where you have the custom designed centre that will allow mounting on a pole.